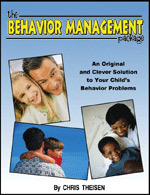 Our Behavior Management Package consists of five (5) unique parenting tools specifically designed to eliminate problem behaviors. Each download provides parents with a clever and effective tool that helps to improve child behavior. 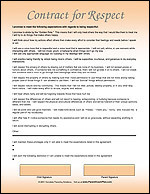 A behavior contract is a written agreement that clearly states the behavioral expectations of a particular child or student. 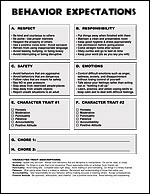 A well-designed behavior contract will help decrease incidents of negative and/or inappropriate behavior while teaching important character traits such as responsibility, self-discipline, obedience, and accountability. 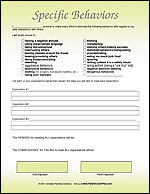 Parents can use behavior contracts to establish clear behavioral expectations for their children. 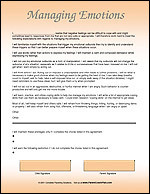 A well-designed behavior contract spells out the rewards and consequences that are earned for meeting (or not meeting) the expectations that are stated in the contract. 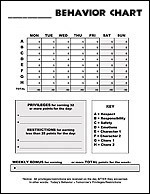 This well-designed behavior chart is a great way to monitor and record your child's conduct each week. It provides your child with a visible reminder each day as to what his or her expectations are and also provides the structure and motivation that your child needs to become a more independent and well-behaved child. Your child will appreciate the structure and consistency that this unique chart will bring to his or her daily routine... and you will be amazed at how simple and effective it is to implement. Behavior Bucks are designed to help parents implement a token economy into their daily household routines. This is a fun and effective behavior management tool that children really enjoy. 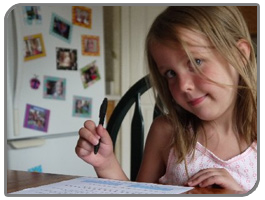 Imagine how pleased you'll be as your child begins to take initiative around the house. Imagine, too, how impressed you'll be with your child's newfound desire to be responsible, respectful, and helpful!